Cost: Admission is free. Items available for purchase. FYI: Parking is available in the neighborhoods surrounding the market. Consider biking, walking, or riding a bus to the market. The musical act on June 16 is Hot Flashes. June 16 is also a special event day, Pollinator Day, and will feature presentations and booths about pollinators (bees, birds, bats). Strawberries, lettuces, and many other delicious foods are now in season! 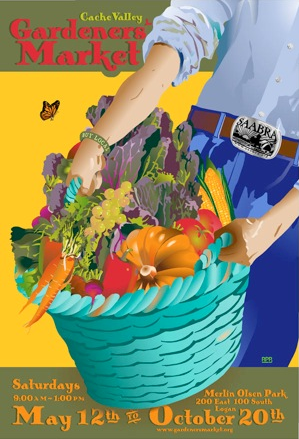 Stop by the Cache Valley Gardeners' Market to pick up the makings for a delicious meal. The Gardeners' Market is one of my favorite Cache Valley traditions. It has been happening for 20 years now, but I hear it has grown a lot since I was last able to visit in 2009. (I moved out of state for a few years.) I am excited to see the changes, so I hope I can make it tomorrow. A leisurely stroll through the shady market is the perfect Saturday morning. Park between the Market and Tabernacle Square and you can easily walk to Summerfest, too. P.S. : What is your favorite thing to buy at a farmers' market? Personally I can't stay away from arugula and fresh herbs. I also hope someone will have sour pie cherries at the market this year (maybe in a week or two?). I love to eat them out of hand, so they never even make it into jam or pie around here!